Within a tournament preview in The Times, on the opening day of the 1988 European Championship, Ruud Gullit assessed the talents of his Netherlands teammates. He was unequivocal in his opinion on which member of Oranje posed the most potent threat to his nation’s opponents. “Van Basten could be our greatest weapon. He has a special ability to see goals and make space when there appears to be none. After missing most of the season, he is so determined.” But Marco van Basten very nearly didn’t make the trip to West Germany for Euro 88. An ankle injury sustained the previous November had restricted Van Basten to just 11 appearances during the 1987/88 season, his first season in the famed red and black stripes of AC Milan. The Utrecht-born striker largely watched from the stands of the San Siro as the Rossoneri claimed their first Scudetto title in nine years, playing the opening cluster of games then returning for the run-in, when he scored a crucial winning goal at home to Empoli and then away to Napoli. In Van Basten’s absence, his former Ajax strike-partner, John Bosman, stole a march on him in the race to lead the line for the Netherlands at the finals of their first major international tournament in eight years. Prior to Euro 88, Bosman was widely tipped to be one of the stars of the tournament, while Van Basten was dismissed as a half-fit enigma. Bosman enhanced his pre-tournament reputation when he scored a diving header at Wembley three months before the big kick-off in a 2-2 draw. It was a scoreline which flattered the home side, on an evening when Gullit and Ronald Koeman played football of a futuristic variety that left Bobby Robson’s England chasing the spectres of shadows. A further contender for the role of centre-forward in the Netherlands side was PSV Eindhoven’s Wim Kieft. Another former Ajax teammate of Van Basten’s, Kieft had been the Eredivisie top-scorer in 1987/88, his goals helping lead De Boeren to the treble, inclusive of the club’s first – and to this day only – European Cup success. Rinus Michels, the legendary coach, making a return to West Germany with Oranje, in a bid to conclude the unfinished business of 1974, publicly opted for Bosman as the focal point to his plans. Outwitted by Valeriy Lobanovskyi and his Soviet Union side in the Netherlands’ opening game, Michels made two changes to his line-up for the vital win or bust second group game against England in Düsseldorf. Out went the left-sided midfielder John Van ‘t Schip and, more surprisingly, Bosman. 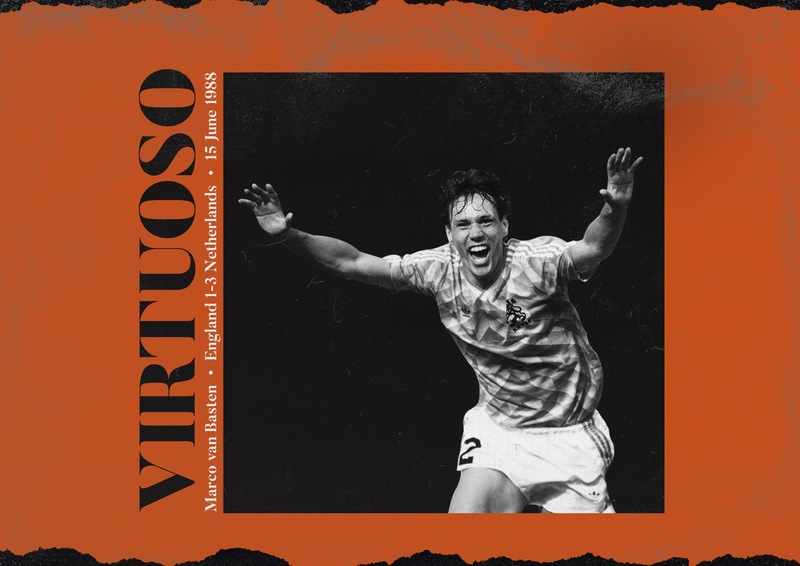 While Van Basten had appeared on the hour mark against the Soviets, and his inclusion against England had been widely expected, it had been thought it would be in support of Bosman, rather than in-place of him, with Gullit dropping into a deeper role. Instead, Michels kept Gullit higher up the pitch and unexpectedly drafted Erwin Koeman into the midfield. It was the touch of a coaching genius and it ultimately decided the outcome of the game. England too had lost their opening game of the tournament, against Ireland, which, when combined with the Netherlands loss to the Soviet Union, lent itself an on-pitch cup tie at the Rheinstadion, to go alongside the sense of off-pitch unease, percolated by three days of rioting between England supporters and young locals looking to make a negative reputation of their own. Bobby Robson had countenanced that containment of the Netherlands as an attacking force was a futile gesture. Terry Butcher was absent from the tournament with a broken leg, while his deputy, Tony Adams, having struggled against the aerial threat of Ireland, was thought vulnerable. Everton’s Dave Watson, seen as a realistic alternative to Adams, wasn’t fit to play. With all of this in mind, Robson made two changes to his line-up, just as Michels had. Out went Chris Waddle and Neil Webb, while in came Trevor Steven and Glenn Hoddle. It was one of the bravest decisions Robson ever made as England manager. He was essentially setting out to fight skill with skill. A peculiar first-half unfolded. For large swathes of it, the Netherlands were the better team, but most of the clear-cut chances fell England’s way. A mix-up between Ronald Koeman and his goalkeeper, Hans van Breukelen, in the opening few minutes led to Gary Lineker hitting the Netherlands post from an awkward angle. At the other end, Van Basten showed a flash of the speed of thought and movement that he would display later in the game, as a decent shout for a penalty was waved away by the referee. A further misplaced pass from Hoddle was seized upon by Gullit; again Van Basten was the recipient of the ball and England were lucky to avert the danger. It all made for an open start to the game and the signs of what was to come were there to be seen. The movement, the positions taken up by Van Basten, were essentially dress-rehearsals for the goals which would flow later-on. Before Van Basten’s avalanche began, however, Hoddle struck the very same post that Lineker had earlier hit. The Monaco midfielder arrowed and arched a beautiful free-kick from distance, which was just out of reach of the despairing hand of the fully extended van Breukelen. The Netherlands had dominated the first half, but also ridden their luck. Just a minute before half-time, Van Basten punished those England near-misses. Frank Rijkaard dispossessed Lineker of the ball, from where he sent Gullit away down the left and into the England half. Almost goading Gary Stevens to make the first move, he waited until Mark Wright also drifted across, before he played the most outrageous ball with the outside of his right foot to Van Basten. Loitering with intent in the penalty area, he collected it on his left foot, with his back to goal and perhaps slightly overstretched. It was the manner with which Van Basten killed the ball that made the first of his three goals. There and then the penny dropped, for not only the Netherlands striker, but for the England defenders too. Adams is isolated. Van Basten twists 180 degrees, prodding the ball forward with his right foot and into space, moving diagonally across Peter Shilton’s goalmouth. Shilton’s 100th England appearance is about to implode. Despite responding as quickly as he could, Adams has lost his man and Stevens attempt to intercept is half a yard too short. Van Basten, falling as he makes contact with the ball, watches as it flashes past Shilton and into the back of the net. The noise generated within the Rheinstadion is electrifying. The speed of it all is devastating and Stevens is forced to clear another effort off the line before the half-time whistle is blown. Punch-drunk at the ferocity with which the Netherlands ended the first 45 minutes, at the break, England regroup. They try not to panic and, within eight minutes of the restart, they are deservedly level. Bryan Robson gets on the end of a well-worked move and Michels goes back to the drawing board. Kieft replaces Vanenburg on the hour. For the 15 minutes beyond their equaliser, England are at their most assertive. Wright strides forward with the ball for England more often than Ronald Koeman does for the Netherlands. Lineker hits Van Breukelen’s crossbar with a header. The linesman’s flag is raised, but erroneously. Hoddle dictates proceedings. Then comes the pivotal tilting of the landscape. Seemingly struggling with an injury, Steven is replaced by Waddle with just over 20 minutes remaining. In the blink of an eye, the balance of the England midfield is lost. Within a short few minutes, the Netherlands reclaim their lead. Blessed with a heavy slice of fortune, Gullit receives the ball on the edge of the England penalty area. Despite the slipshod manner of how he came into possession of the ball, from the moment Gullit obtains it, genius is now in operation. Unchallenged, Gullit turns and rolls the simplest of balls diagonally to his left, where Van Basten again sparks to life. Hands are raised in unison amongst the England defensive line and Stevens is hung out to dry once more. Low and left-footed, Van Basten drills the ball beneath the exposed Shilton. This is footballing rope-a-dope. Four minutes later, Van Basten’s hat-trick is complete. This time England almost gift-wrap the goal. Erwin Koeman swings in a corner from the right, Kieft flicks it on, it evades everyone, and there he is, Van Basten, unforgivably unmarked at the back post. When the ball drops to him he plants it, right-footed, into the turf, from where it bounces up and seems to go through Shilton as if he is a hologram. Before England are put out of their misery by the final whistle, Van Basten nearly scores again. The game and the result are the catalyst for the Netherlands to win Euro 88. Van Basten scores the winning-goal in the semi-final against the hosts and then hits ‘that’ volley in the final, which leaves the great Rinat Dasayev literally staggered. Predatory is a word used too often in football. It is a word which has become an empty platitude to any striker who hits the 20-goal mark once in their career. Van Basten really was predatory, however. Greedy, destructive and rapacious – as much as his performance against England at Euro 88 was brilliant, it is remarkable for the ruthlessness of it all. It was clinical, it was precise, and it was so good that it was frightening.